Size: 64 GB Stylish Portable Storage in a Protective Rotating Jacket Lexar offers acomprehensive line of high-performance USB flash drives designed with a widevariety of features, capacities, and capabilities. With so many options, it'seasy to find the right Lexar JumpDrive product to fit your needs andlifestyle. 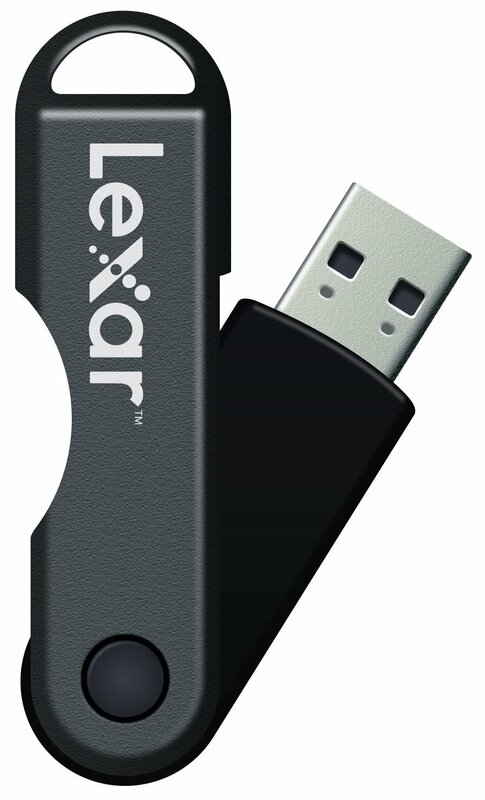 Lexar JumpDrive TwistTurn is a high-capacity USB flash drive thatprovides a convenient solution for storing, transferring, and sharingmultimedia and more. Convenient, High-Capacity Solution High-Capacity Storageand Stylish Housing. JumpDrive TwistTurn is available in a range of largecapacities, allowing you to transfer, store, and share a vast number of data,photo, music, and video files. The drive has a capless design with a rotatingcase to protect the drive and its contents, providing an excellent combinationof durability and convenience. Plug-and-Play Design with Great Features.JumpDrive TwistTurn has a simple plug-and-play design that allows you toquickly and easily store files, so wherever you go, your information goes withyou. Its durable hinged jacket rotates to easily access a USB port, and itsports an LED activity light that blinks during file transfer, so you knowwhen the job is done. JumpDrive TwistTurn also works across platforms, givingyou flexibility and ease of use. Created to suit your style, JumpDriveTwistTurn is available in a different stylish color for each of its varyingcapacities. It also makes a fashionable accessory and comes with a key chainhole, making it easy to tether to a key ring, attach to a backpack, or hook toa purse or briefcase. With large storage capacities and stylish design, LexarJumpDrive TwistTurn is an incredibly versatile and convenient portable storagesolution. Lexar. When Memory Matters. DISCLAIMER: Actual usable memorycapacity may vary. 1MB equals 1 million bytes; 1GB equals 1 billion bytes.